Great Podcast with Joe Rogan and a couple of archaelogists who suggest that around 13,000 years ago, we were much more advanced (at least a great portion of us) than previously thought. Evidence shows that the great sphinx was built much much longer ago than thought, as was perhaps the great pyramid. These scholars believe that, therefore, (and for a few other reasons) it was not the Egyptians that built these structures). One other reason given is that there is no reason to believe that the Egyptians could cut stone like that so precisely (including granite! There has never been any sort of saw or cutting tool found in Egypt bigger than a small one hand copper hand-saw. And while there have been many depictions and Ancient Egyptian art showing handsaws, there has never been any drawings of large saws found. Not to mention, large saws couldnt really cut the granite stones anyways. But the most intriguing find is Gobekli Tepi, which predates Stonehendge by 6,000 years and is much much larger and sophisticated and impressive from an engineering standpoint. Then the skeptic Michael Shermer got wind of this podcast and came on to confront these two scholars, and really got a drubbing. Really did, from both scholars and Joe Rogan himself. Here is the second podcast with the debate including Shermer. In hindsight, im not sure this post really fits the forum or sub-forum. Feel free to delete it. Im not overly attached to it. I think it may have indirect relevance to this forum - after all, anything that sheds light on the history of consciousness is relevant. I haven't yet listened to the videos - are you saying they may not be worth consideration? 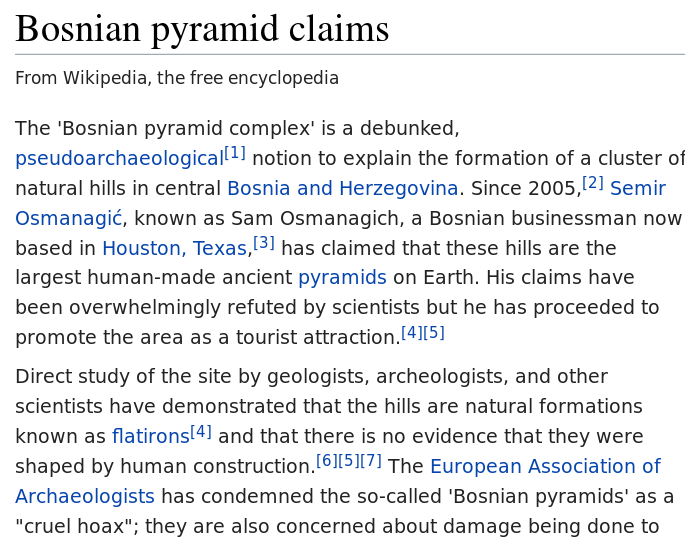 I'm interested in the Bosnian Pyramids. This guy lectures on the "consciousness" aspects of them. Hippie, but interesting. "Nigel Grace argues that the Bosnian Valley of Pyramids represents the biggest complex of pyramidal structures in the world. Nigel shows evidence revealing that these pyramids may be 25,000 years old. Nigel also describes his personal experiences of healing and awakening while working in the tunnels and on the largest of the structures." Of course you must look at the "other side". Randall Carlson are both researchers and authors.... not archaeologists. I do love them both, though. Graham Hancock and Randall Carlson are both researchers and authors.... not archaeologists. That doesn't bother me much. I think things are more simple than people make them out to be and that if you read the work of enough experts on a non-technical subject (ie like not quantum physics etc) and you do it on the level that these guys do, your opinion is just as valid. His work is essentially based upon his interpretation of the work of other archaelogists. Hes not the one in the field doing the evaluations, but he can see their published results, and forming an overarching opinion of the data (for something like this) really does not require that you be an archaeologist by trade. In that second video, when the archaeologist comes on to debate him, he holds is own just fine. I don't know if I can recommend them unless you are intensely interested in the topic, both videos are over 3 hours. The gentleman in the video I posted, even they aren’t overly impressed by the Bosnian pyramids. They are interested, but state that the other sites are much more relevant and provide a sounder base for their ideas. But I’m with you personally, I find them quite interesting. I've watched both the videos now. They're enjoyable. Shermer has some very obvious tactics he likes to use that come out over and over and over again this second video, and his friend is just plain rude. I found it difficult to sit through Shermer's friend's combative rants. I noticed Shermer almost constantly deflects with "scientists are busy so they don't look at this stuff" and then "scientists in these fields have a consensus that this isnt true, why do you think that is?" and lastly "all these other cases turned out to be false or hoaxes" as if that is some kind of argument. What I really wish Shermer had been challenged on is when he says 'thats science' in regards to the horrible push back many scientists face as if that somehow justifies them being black listed from academia. This highlights to me an area of extreme blindness. Give everyone a platform, let them speak and then challenge their ideas. Don't throw them from the stage and lock them out of the building. Youre right. Shermer uses horrible arguments. I see this time and time again from him. Especially, as you mentioned the "the other cases turned out to be wrong" argument. He's not a real skeptic at all. Ironically hes virtually the exact opposite in my opinion. Shermer is clearly a good dude, and he is very intelligent, he just suffers from the disease of modern scientism, which not all scientists suffer, but he does unfortunately. Hmmmm, I'm not sure why I posted that.... came across badly, I think. Anyway, Shermer was more affable than I was expecting. The later expert was truly awful, but eventually realised he was beat and changed tactics - snidely trying to separate Carlson off from Hancock by conferring a degree of respectability on the former while maintaining scorn for the latter. Unfortunately I think Carlson fell for it a little. Michael Cremo got a mention somewhere.... maybe I'm not completely convinced by his work, but he does bring up some interesting anomalies in the historical record that open the door to civilisation (and or humanity) being waaaaay older than even Hancock suggests. Don't do that. It's a HEAVY slog, and not worth it, but his examples are cited with excruciating academic precision. Thanks for the tip-off.... Forbidden was on my to-get list. I think integrating the full ramifications of his ideas is a little much for my tiny little mind. It's a fascinating study. Knowing the trivia is cool. Comparing the competing historical narratives is a fun team sport. The only really interesting question is "Are these aliens/gods/demons/ubermench still around, or are they coming back?". I half hope not, and half hope so. I get this. But it all helps me practice at keeping my sense of possibility wide open. Interestingly, this story seems to have been buried, no updates on it at all. I don't know. To be honest, he seems to be very disingenuous to me. Misquoting researchers is intellectually lazy at best and malicious at worst. I honestly lost all respect for him after this interview.